In celebration of this site's ninth birthday, we're sharing some of our favorite stories from the past. 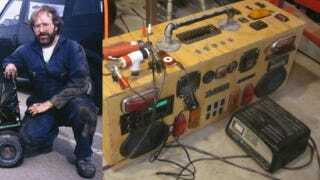 With a little help from Andrew Collins we were able to fix this classic post from Murilee Martin that taught everyone how to turn junkyard finds into a fully functioning boombox. This post is more than six years old and thus a victim of so many Gawker redesigns that it was almost unreadable. All the images were borked beyond recognition and the text was out of line. While it's been years since anyone cared about pageviews on Jalopnik, there once was a time when we got bonuses based on those and thus, that clever minx Murilee made this post into a giganto how-to gallery. It murdered. It also made the post almost impossible to reconstitute without the assistance of both Murilee and Andrew, who remade the post with recovered photos. I love this post because it shows just how creative a gearhead can be. For less effort and only a little more money you could just go out and buy a boombox that probably sounds as good, if not better. But that's not the point. What Murilee has is wonderful and unique and just a little crazy, which might as well be the tagline for this whole damn website.